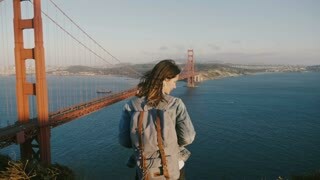 Camera zooms in behind young happy woman with backpack, hair in the wind enjoying sunset scenery at Golden Gate Bridge. 4K. Downtown Los Angeles city skyline at night. Time lapse. People get on a bus where the conductor comes to sell them tickets in London in the 1950s. Two African students in the countryside outside London go to the bus station in the 1950s. HONG KONG- june 26: Junk boat in Victoria Harbour in Hong Kong on june 26, 2016. The Junk boats with the characteristic red sails are one of the most iconic motives often photographed in Hong Kong. Time lapse of The Great Wall of China climbing high into the mountains of Jiankou, China. TORONTO, CANADA on OCTOBER 4th: Royal York Hotel in Toronto, Canada on October 4th, 2013. The Royal York Hotel is a large and historic hotel in downtown Toronto, Ontario, Canada, at 100 Front Street West. It was opened on June 11, 1929. 4K View from behind of young successful business executive looking out at view of the city. View from the window shows famous London skyline with iconic buildings. Slow motion. Aerial drone shot to the London Eye and fly over it by night. Beautiful view over the city. QUEBEC CITY, CANADA on July 12th: Chateau Frontenac and tour bus in Quebec City, Canada on July 12th, 2016. Quebec City or Ville de Quebec in french, is the capital of the province of Quebec in Canada. Mona Lisa painting by Leonardo da Vinci at the Louvre museum in Paris. 4K. Slow motion young happy excited tourist woman enjoying epic hike at atmospheric cactus desert Arizona national park. View of the Eiffel Tower and the Seine shot through the window of a metro train. Paris, France.